However impossible it may appear, it really does seem as though every year the excitement about Christmas in our household notches up a gear. Last year was probably the first year that G got really excited about it – something I think the build up at nursery helped with, as well as the arrival, of course, of a new baby sister. But this year it was at fever pitch. Above anything else, I can’t help but be astounded at the almighty power of one little phrase at Christmas. “Do I have to tell Santa?” really does deliver in all eventualities. 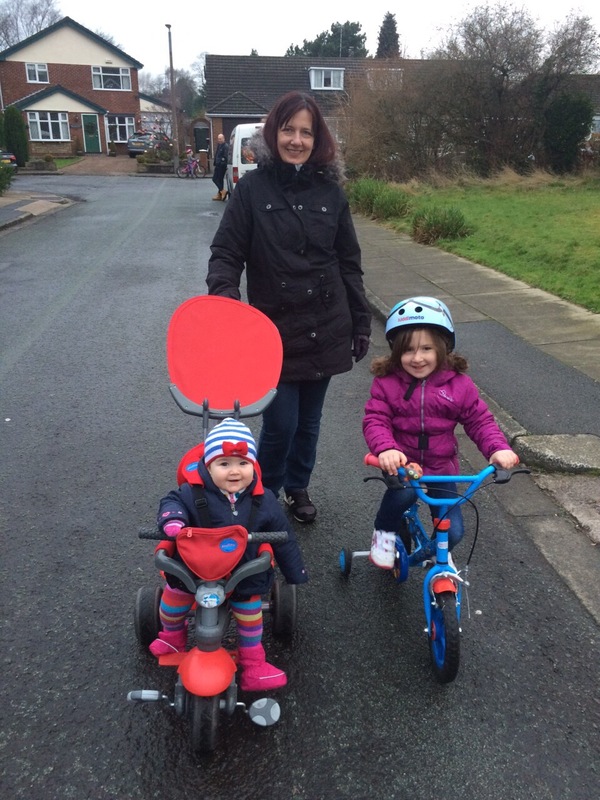 Santa might not have brought our girls bikes this year (their current ones are perfectly good for a while yet) but after a day of present opening, Lego building, eating and playing we decided it was high time we got outside for a Boxing Day bike ride. It was actually C’s first go on the Smart Trike, so I guess we could class it as a Christmas present. And she loved it. But not as much as G, after we’d raised the seat and handlebars on her bike in recognition of her growth in height since the summer when we last used it. In good British style we used the opportunity to nip to the local shop to pick up some essentials, because clearly emptying not one but two different supermarkets on Christmas Eve wasn’t enough to get us through a few days. It’s a bit cold outside for regular trips out on the bike, but now G’s proven she can get to the shop and back safely and without too much moaning I think we’ll be doing it again. At 6 days old, C was understandably nonplussed by Christmas this year, but her big sister more than made up for it, running into our room first thing shouting “Santa’s been!” and delighting in helping her baby sister open her presents, as well as her own. It was all a far cry from last year’s performance, where G managed to step over her stocking without noticing it, and stumble blurry eyed into our room oblivious to the previous night’s Christmas preparation efforts. Christmas for me is usually a blur of crafting efforts and a day spent hovering in and out of the kitchen, with attempts at homemade Christmas presents discarded at last minute when I realise I haven’t got time to finish them, making notes of who bought what ready for writing thank you notes and channeling wrapping paper straight into the bin, and of course spending a disproportionate amount of time making Christmas dinner. This year, somewhat blurry eyed myself from nights of cluster feeding from C, I happily handed over all these duties to the other half, who did a sterling job. 3 years of being a stay-at-home-Dad means he’s more at home than I am in the kitchen nowadays, even whipping up a batch of pannetone and serving up peach bellinis (our prize from the school Christmas fair bottle tombola) with breakfast. C did her part by sleeping through Christmas dinner meaning I got to eat it both two handed and whilst it was still hot – a revelation! 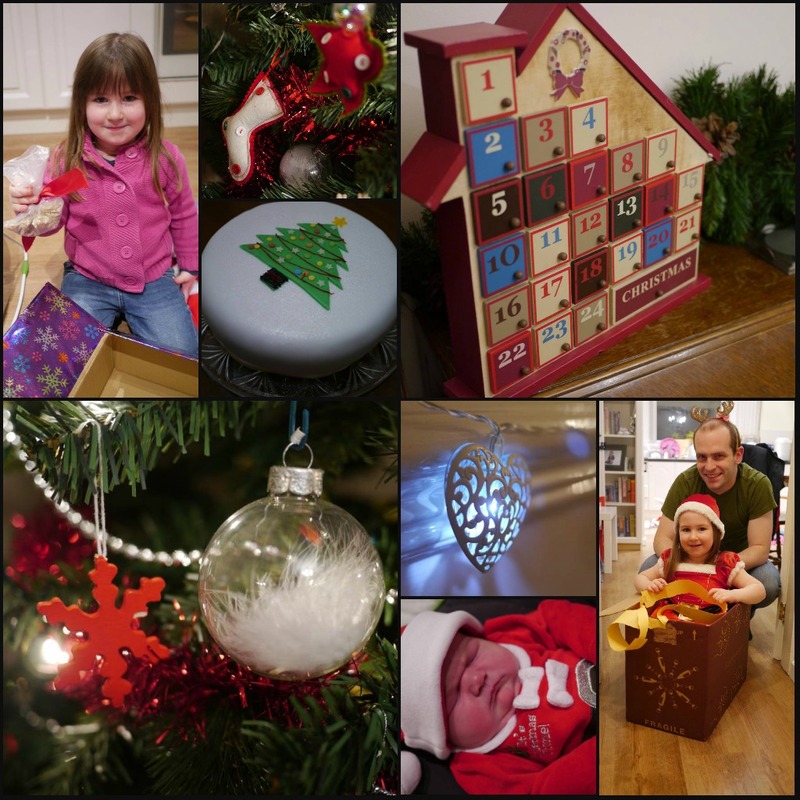 It’ll be a few years before C’s excitement about Christmas reaches her sister’s fever pitch, but this year really proved what others have told me before – it might be fun being a kid at Christmas, but it’s even more fun having kids at Christmas.